A compound in blueberries may be good for preventing bowel cancer, US scientists believe. The key ingredient, pterostilbene, is a natural antioxidant and mops up highly reactive molecules called free radicals that can trigger cancer growth. Similar antioxidants have already been identified in grapes and red wine, the American Chemical Society heard. Other work, also in mice, suggests pterostilbene may be good for lowering blood cholesterol too. The researchers, from Rutgers University and the US Department of Agriculture, suggest the compound could be put into a pill. Lead author Dr Bandaru Reddy said that, in the meantime, their work showed the need to include more berries in the diet, "especially blueberries." Rats given a cancer-causing agent but then fed pterostilbene had far fewer pre-cancers in their bowels than other rats. 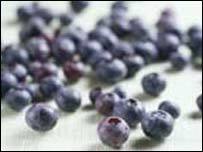 The blueberry compound also reduced inflammation and the rate of cell division in the bowel, which are both considered to be cancer risk factors. Although experts do not know the exact causes of colon cancer, the disease has been linked to a high intake of saturated fats and calories. Dr Reddy and colleagues believe pterostilbene may be able to reverse this process, possibly by lowering fat levels like cholesterol. Experts already recommend eating plenty of fruit and vegetables - at least five portions a day - to guard against cancer and other diseases. Pterostilbene is also found in cranberries, sparkleberries, lingonberries and grapes. Ed Yong of Cancer Research UK said: "While pterostilbene could lower the risk of bowel cancers in rats, it is unclear if it will produce the same benefits in humans. "More research will help to determine whether this chemical could have a role in the fight against cancer." "For the moment, the best advice is to eat a healthy, balanced diet rather than rely on specific 'superfoods,'" he added.